Sunday night was twice as nice for Anaheim’s Corey Perry, whose overtime goal just happened to be the series-winning marker against Calgary. 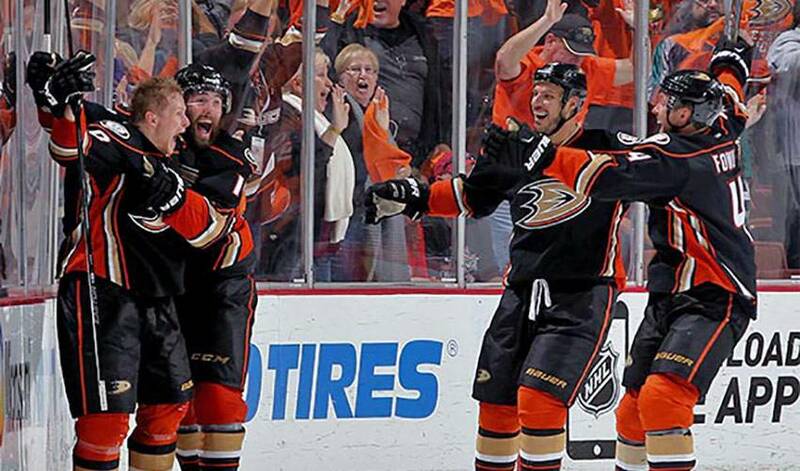 It was Perry’s tally just 2:26 into the extra frame that delivered the Ducks a spot in the Western Conference final, where they’ll face the Chicago Blackhawks, with a trip to the Stanley Cup final on the line. Perry netted his fourth goal and recorded his eighth point in the series and has a playoff-leading 15 points in nine games. STAT PACK: Perry fired eight shots on goal in 20:02 of ice time, taking 26 shifts. NEED TO KNOW: Perry's younger brother Adam played alongside him on the London Knights’ Memorial Cup-winning side in 2005, a year in which Corey won a slew of awards, including the Red Tilson Trophy as the Ontario Hockey League MVP and the Stafford Smythe Memorial Trophy as the Memorial Cup MVP. ALL THAT GLITTERS…: Playing alongside Sidney Crosby and Patrice Bergeron, Perry won gold with Team Canada at the 2005 World Junior Championships. He also struck gold at both the 2010 and 2014 Winter Olympics. GIVING BACK: Perry is involved with raising funds for Wellspring London, a non-profit organization that offers psychological, emotional, social, spiritual and informational support to individuals and families living with cancer. NO SLEEPING ON THE JOB: As a teenager, Perry worked loading mattresses onto trucks at a local bedding warehouse. PAR FOR THE COURSE: Perry won a car after finishing as the low celebrity at the 2010 Wayne Gretzky Classic Golf Tournament. HONOURABLE MENTIONS: Henrik Lundqvist had 42 saves in a 4-3 New York Rangers’ win that pushed their series against Washington to seven games. Chris Kreider scored the first and second goals of the contest for the Blueshirts. His first came 40 seconds into the opening period, and the other with less than one second to go in the first frame. Karri Ramo faced 47 shots from Anaheim. FRIDAY/SATURDAY STANDOUTS: Derek Stepan (2A) assisted on the game-tying goal and game-winning marker in Friday’s 2-1 Rangers’ win over the Capitals. Jakob Silfverberg (1G, 1A) helped lead the way in a 4-2 Anaheim win in Calgary. Henrik Lundqvist had 28 saves in New York’s victory. On Saturday, P.A. Parenteau netted the winner as Montreal stayed alive in their series against Tampa Bay. Devante Smith-Pelly opened the scoring. Steven Stamkos scored at 9:27 of the third period for the Lightning.